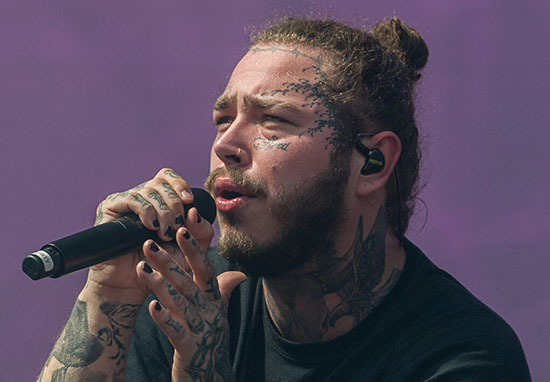 Post Malone – the rapper, singer, and tattoo artist’s canvas – was involved in a serious car crash in the early hours of Friday, September 7, in West Hollywood. The rapper’s Rolls Royce reportedly collided with a Kia before crashing through a fence and coming to a stop in some hedges. The incident occurred at around 2.40am in Beverley Hills. The car owned by the 23-year-old musician was being driven by his assistant, with Posty in the passenger seat, reports Billboard. Fortunately, no one was injured in the incident. However, as the crash comes just a few weeks after Post’s private jet had to make an emergency landing, some fans are convinced there’s something sinister behind it all. Namely, the Illuminati, of course. Malone acknowledged the accident, tweeting ‘god must hate me lol’, but his fans and conspiracy theorists had other ideas. it’s not that he hates you it’s just that the illuminati is taking YOU out next. are you sure you’re not being targeted by the illuminati?! Did you survive an Illuminati attempt? Praise be. ?????? Illuminati wants to take post Malone too? He ain’t look like much but he makes good music so we must protect him at all cost. Speaking to The Blast after the crash, however, Posty was shaken but defiant. God’s gotta hate me. I’m fine, man. Somebody came and hit us…. We spun out. Almost a plane and almost a car. You can’t f*ckin’ kill me, you motherf*ckers. Last month, Post Malone was on a private plane, headed for Reading Festival. Shortly after taking off from Teterboro Airport in New Jersey, however, the plane’s tyres blew out, forcing the pilots to make an emergency landing. A source revealed air traffic control at the site told the pilot to continue the flight to Massachusetts for a safer potential crash landing. After circling the air for some time, though, the plane finally landed at Stewart International Airport, New York. The private jet reportedly had 16 people on board – Posty and his entourage, as well as the flight crew. Just minutes after the plane landed, the rapper tweeted to his followers, to let them know he was safe and well, thanking them for their well-wishes. Following the incident, many of Post Malone’s fans have taken to Twitter to suggest the problems with the plane might have been part of an attempted murder plot. Still, all these close calls with death aren’t doing Posty’s career any harm. His first album, Stoney, recently broke a record held by Michael Jackson for 34 years. That’s not all, either, he also broke a 54-year-old record held by the Beatles for most songs simultaneously in the top 20. Illuminati or not, it can’t be all bad for Post Malone.